WAIPAHU — Hevanilea Haunga scored a goal in the first half and assisted on another in the second to lead top-seeded Kamehameha to a 2-0 win over Kauai in the semifinals of The Queen's Medical Center/HHSAA Division II Girls Soccer State Championships Friday. The Warriors (12-4) extended their win streak to nine games and will play in the title game for the second time in three years. They will meet four-time defending champion Hawaii Prep, 5 p.m. Saturday at Waipio Peninsula Soccer Stadium in a rematch of the Big Island Interscholastic Federation finals two weeks ago. The Red Raiders (11-3-1) saw their five-match win streak snapped. They will face fellow Kauai Interscholastic Federation-member, Kapaa, for third place at 3 p.m. Saturday at Field No. 6. Haunga, a senior forward, scored her team-leading 17th goal of the season on a breakaway in the 15th minute. She split a couple of defenders down the middle of the field, took a couple of dribbles and then fired a left-footed shot in the right side of the netting. "Kauai plays high on defense — they were trying to catch us offsides — so basically I just had to sprint back to get onside and then our teammates in the middle hit that ball through and then Kauai just wasn't expecting it; I just quickly turned and got in," said Haunga, who signed with UNLV Wednesday morning. Kamehameha-Hawaii took a 1-0 lead into halftime and added an insurance goal early in the second half on sophomore midfield Chenoa Frederick's goal off a cross from Haunga in the 48th minute. "We practice that — we call it then ‘bangoo' — so we just drive down that line and we hit it back to the 45. All the girls know that we gotta get there to get that goal, so they were prepared for that," Haunga said. The Warriors posted 17 shots on goal, of which 14 were saved by Kauai freshman goalkeeper Janelle Puplava. 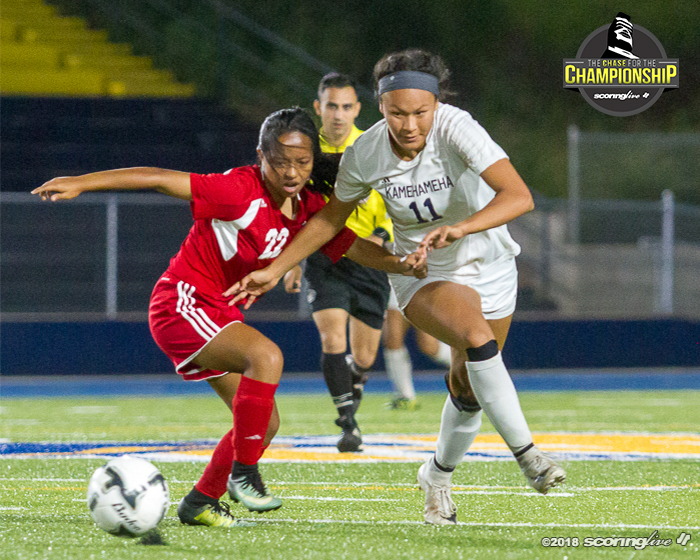 The Red Raiders were limited to only two shots on goal; both were saved by Kamehameha-Hawaii senior Kiani Troy. Junior center-back Kaila Ambrosio anchored the Warriors' defensive effort. Early in the second half, Ambrosio made a key defensive play to halt a Kauai attack. Red Raiders' speedster Mia Takekuma drove a ball down the right sideline and got near the end line, in seemingly ideal position to force a corner kick. However, Ambrosio quickly kicked the ball off Takekuma and across the end line for a goal kick. "She's a leader back there; she leads that group back there," Kamehameha-Hawaii coach Joshua Woodard said of Ambrosio. "She keeps us in line and in control of everything, so she's a big part of this team." The game was originally scheduled for a 3 p.m. kickoff at the Waipio main stadium. However, a Kauai team van was involved in an accident en route to the complex and several players were taken to an area hospital as a precautionary measure. According to the HHSAA, Kauai had the option of postponing the semifinal to Saturday, if need be, but opted to go ahead and play Friday night. The match was consequently pushed back to a 7 p.m. start time and moved to nearby Waipahu High School. "It was a little bit of a rocky start for us, but the fact that the girls rallied together, they chose to play today and they came out and it was a 2-0 loss and I will take that," Kauai coach Auika Metcalfe said. "I really think our girls fared well with everything that happened today and we played our hearts out." Haunga said the Red Raiders' situation was somewhat of a roller coaster for the Warriors. "In the beginning we were very sad for them — we were worried about them. We didn't know if they were even going to be able to come to the game," Haunga said. "We were more worried about their safety than we were worried about the game, but when they let us know that it wasn't serious, we knew that we had to get set into game mode and we told ourselves that ‘7 o'clock. It's going to happen,' so we just prepared for it." Kamehameha-Hawaii and Hawaii Prep have split two prior games this season. Ka Makani won the regular-season meeting on Dec. 7 by a score of 4-1, but the Warriors avenged the loss with a 1-0 win in the BIIF title game on Jan. 27. The teams met in the 2016 D2 state final, which HPA won, 1-0.